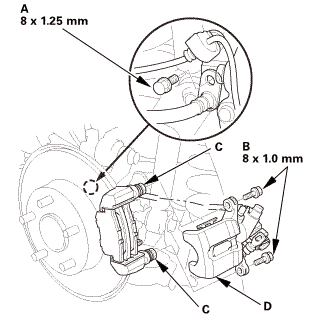 Remove the flange bolts (B) while holding the respective caliper pins (C) with a wrench. Remove the caliper body (D). NOTE: Do not twist the brake hose and the parking brake cable to prevent damage. Check the hose and pin boots for damage and deterioration. 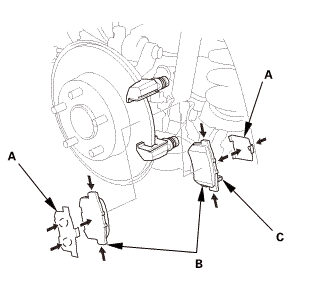 Remove the pad shims (A) and the brake pads (B). 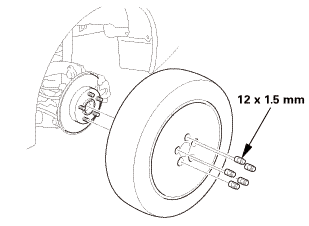 Using a micrometer (A), measure the brake disc thickness at eight points, about 45 ° apart and 10 mm (0.39 in) in from the outer edge of the brake disc. 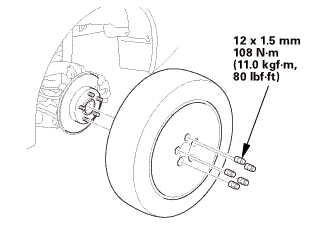 Replace the brake disc if the smallest measurement is less than the maximum refinishing limit. 0.015 mm (0.00059 in) max. *: This is the maximum allowable difference between the thickness measurements. If the brake disc is beyond the service limit for parallelism, refinish the brake disc with a Honda-approved commercially available on-car brake lathe. Inspect the brake disc runout. 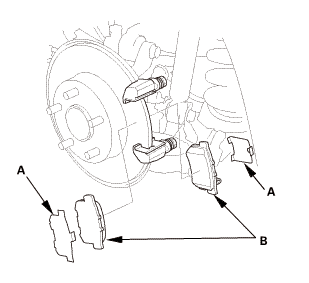 Apply a thin coat of M-77 assembly paste (P/N 08798-9010) to the pad side of the shims (A), the back of the brake pads (B), and the other areas indicated by the arrows. NOTE: Wipe off the excess assembly paste from the pad shims and brake pads friction material. Install the brake pads and the pad shims. 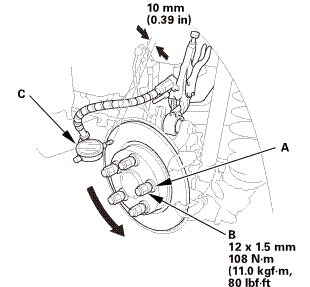 NOTE: Install the brake pad with the wear indicator (C) on the bottom inside position. 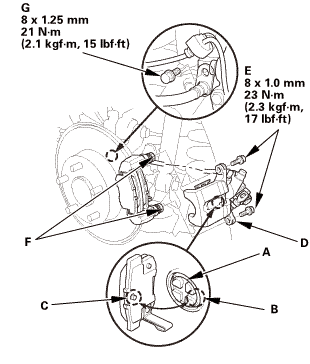 Rotate the caliper piston (A) clockwise into the cylinder. Align the cutout (B) in the piston with the tab (C) on the inner pad by turning the piston back. NOTE: Be careful when moving the piston back in the caliper; brake fluid might overflow from the master cylinder's reservoir. If brake fluid gets on any painted surface, wash it off immediately with water. Install the caliper body (D). 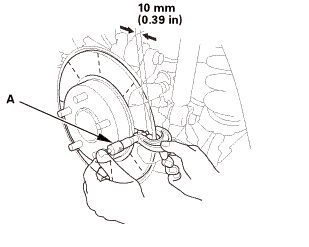 Install the flange bolts (E) while holding respective caliper pins (F) with a wrench. Install the brake hose mounting bolt (G). Press the brake pedal several times to make sure the brakes work. NOTE: Engagement may require a greater pedal stroke immediately after the brake pads have been replaced as a set. Several applications of the brake pedal will restore the normal pedal stroke.